Mamorukun Curse! is a downloadable bullet hell shoot-em-up recently released on the PSN. The US release is a complete package, which includes the DLC bundled in it. In the game, a group of people are trapped in the netherworld and must make their way out by defeating the demons that stand in their way. The characters in the game are all drawn in a manga style for the menus and story, but all of the in-game graphics are 3D. The 3D graphics are fine, not too great but allow for lots of things on the screen with no slowdown (except when intentional). I like the manga style artwork, and it's really nice that you can unlock a lot of the images in the gallery. You can also view some nice pictures of the bosses and even some of the arcade cabinet artwork. Most of the gallery is unlocked through normal play, but there are no requirements on the ones you have yet to unlock so it can be harder to track down the ones you are missing. There are 7 different characters to use, and each one has a different shot type. The shot can be powered up in Arcade and Netherworld Adventures mode, but not in Story where it starts powered up. It also powers up really quickly from collecting capsules from enemies. Collecting Power ups does slightly change your shot, but it mostly just makes it stronger. When this game was released in Japan a couple of years ago, there was DLC for it in the form of costumes. Thankfully, the PSN release in the US has all of that included. Each character has two costumes to choose from, which will affect their in-game model and the picture of them when conversing in story mode (but not the unlockable gallery images from story mode). Since Mamorukun Curse! is a "bullet hell" shoot em up game, you will pilot your chosen character around the screen and shoot lots of enemies and dodge tons of bullets. The shots themselves have patterns, so learning where to stay and when to weave is the key to victory, especially in the sometimes cramped areas. The characters themselves look larger than their hit boxes, which is normal (and very good when narrowly skirting bullets). Shooting can be mapped to the right stick instead of a button. If you choose not to use the dual stick shooting, you will have to move without shooting to change your firing angle. I much prefer dual stick style, since it's easier and more intuitive. You also can't shoot behind you, which while normal, is annoying in a few instances. There are no "bomb" items like other bullet hell games, but what sets it apart the most is the unique "curse" mechanic. Holding the button will charge a curse meter and releasing it will fire the shot off. If the curse shot hits a medium or large size enemy, they will take continuous damage but fire more bullets and any enemy that enters the radius will also be cursed. When a cursed enemy is destroyed, they drop candies that increase your score. They can be collected by moving over them, or if you stop shooting, even briefly, they will all be drawn to you. However, that is not all the curse can do. If you tap the button, the curse will hit the ground in front of your character. If you move through this field, it will curse your character which powers you up for a brief time. It's really nice on bosses, so you can get more damage without having more bullets to dodge. It's an interesting mechanic and certainly something to use effectively if you want to do really well at the game. When you start to charge the curse it will destroy some of the enemy's bullets, so it at least half-functions like a bomb item. There is a cooldown on the curse shot, but used correctly the curse is a very powerful tool. Another unique and cool thing is how lives are handled. Some shoot em ups will have a few hits before you die but no lives and others have 1 hit kills but a few lives. In Mamorukun Curse!, you have multiple characters instead of multiple lives. Each hit will kill a character, but then the next takes their place. It's a pretty cool mechanic that encourages you to try out all of the characters and get decent with them. I will mention that this is not present in Arcade mode, where you just pick one and they can survive a few hits before you have to continue. If you pick up an extra life, it will resurrect the first defeated character and put them back in line. Thankfully, those red bats are yours. There are three main game types: Netherworld Adventures, Arcade and Story Mode. Story Mode will follow the characters as they attempt to escape the Netherworld and reveal the reason they are there. You pick the order of the characters, but once you run out it is game over and you have to attempt the stage again with the same number of characters that started it, so it is possible to get stuck and have to run through part of it again. Arcade gives you a time limit and allows you to choose what stages you complete and in what order. Once you beat a boss, you can opt to do a more powerful version of them for more points and time. This mode is interesting since it gives you a little freedom in what stages you can do (or avoid). It also has unlimited continues, so you can get through it even if you aren't the most skilled dodger of bullets. Since you can only pick one character in this mode, it is also a good way to practice using a single person. 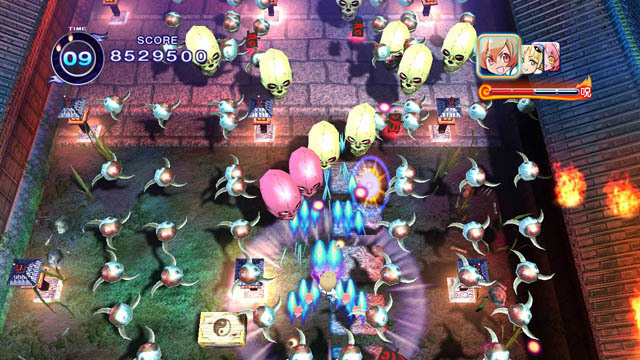 Netherworld Adventures is like a mix of arcade and training modes. You can choose a course, which presents you with one or more stages that you must complete with a limited number of characters. They have a broad range of difficulty levels, so it's actually a very helpful training mode, since it eases the difficulty up and helps you improve. It starts with a few different courses to try, but more open up after completing them. They can get pretty challenging (especially when you have kids running around and being loud while trying to reflexively dodge a hail of bullets). If there are multiple stages in a course, losing on one means you have to do them all over again. One strange thing with the three modes - even in the menu, to back out you have to press start and choose "exit game". I would expect this while actually in the game, so it was odd to have to do that in the menus. In the game, there are many standard trophies and a few unique ones thrown in for good measure. Several trophies are for completing the stages and missions in arcade mode, plus ones for story mode and doing the different challenges in Netherworld Adventures. The most unique ones are defeating certain bosses with certain characters and a few other feats in Story mode. The longest would be acquiring a million pieces of candy and the hardest would be beating the game without continuing for the different characters and difficulties. I appreciate that there are a good amount for different levels of skill. I rarely get a 1cc (credit clear), but I can usually pull it off in two. I'm a fan of bullet hell and shoot em up games, so I'm always glad to see another one brought over to the US. Mamorukun Curse! is a fun game if you enjoy the genre. There's good replay with (of course) getting high scores and getting the various Story mode trophies, but no multiplayer. Three similar yet unique modes offer lots to do just going through them the first time. The characters all have different shooting patterns, but learning to use them all will allow you to smash your way through the various stages. 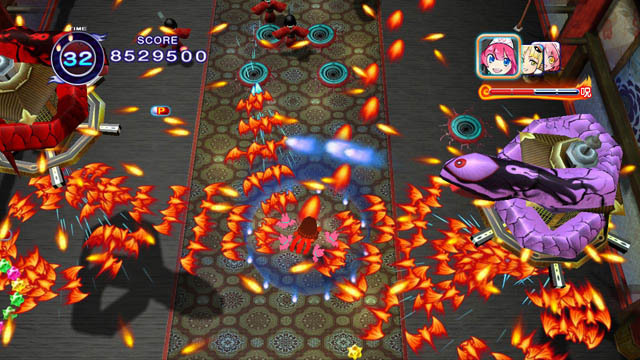 If you are a fan of shmups (I still don't like using that word), Mamorukun Curse! is worth the price.